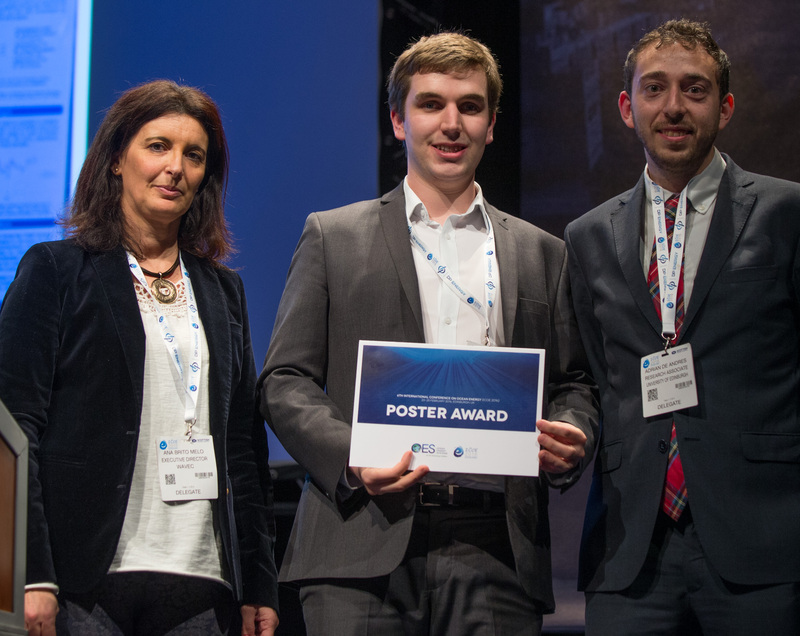 At the International Conference on Ocean Energy (ICOE) 2016 conference one of our IDCORE Engineering Doctorate Students, Anthony Gray, won first prize in the ICOE Poster competition. ICOE 2016 is attended by wave and tidal industry leaders and associations as well as students and academics in the field. Anthony Gray graduated from Cardiff University with a Master’s degree in Civil Engineering in 2011. He began an Engineering Doctorate (EngD) with the Industrial Doctoral Centre for Offshore Renewable Energy (IDCORE) in 2012. Having completed the academic year of IDCORE primarily at the University of Edinburgh, Anthony spent 18 months undertaking a research project with Pelamis Wave Power. The research focusses on operations and maintenance (O&M) strategies for wave energy arrays. Anthony’s work is now sponsored by Wave Energy Scotland and he is due to complete the EngD by the end of 2016. The School of Engineering warmly congratulates Anthony on his fantastic result and success. Anthony, seen here receiving the award with Ana Brito Melo, the Executive Director of Wavec and Dr Adrian de Andres, Research Associate at the University of Edinburgh.